Our mystery last week had to do with seeds. The brown bumps on the outside of the tomato were the clue. You might have been able to guess if I had shown you this view instead. 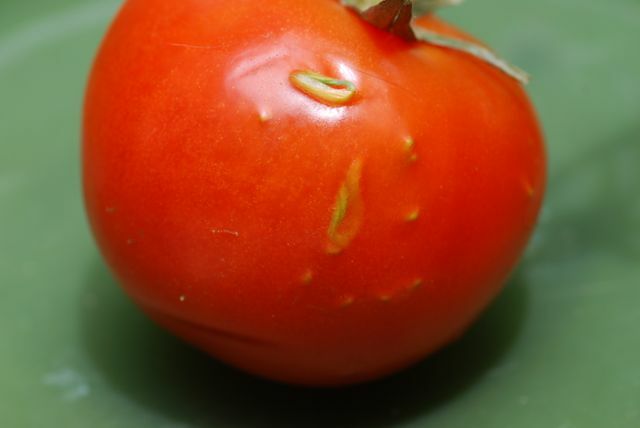 Do you see the stems and green bits under the tomato skin? Peeling back the tomato covering, those are tomato seedlings sprouting inside the tomato fruit. 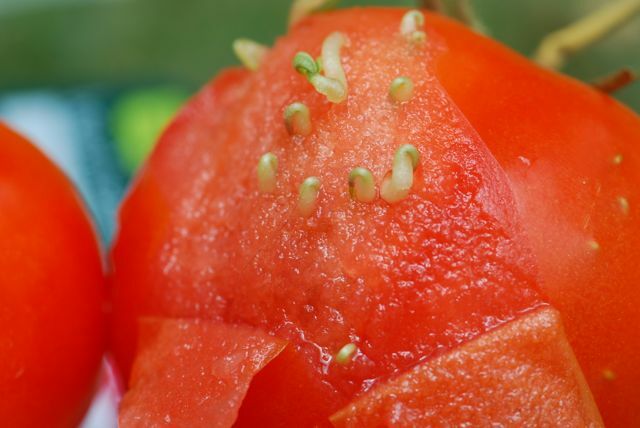 If you open it up to the center, you can see the seeds are sprouting from inside the tomato. It wasn't rotten or mushy at all. All the tomatoes in this cluster that I had purchased from the grocery store had sprouting seeds. 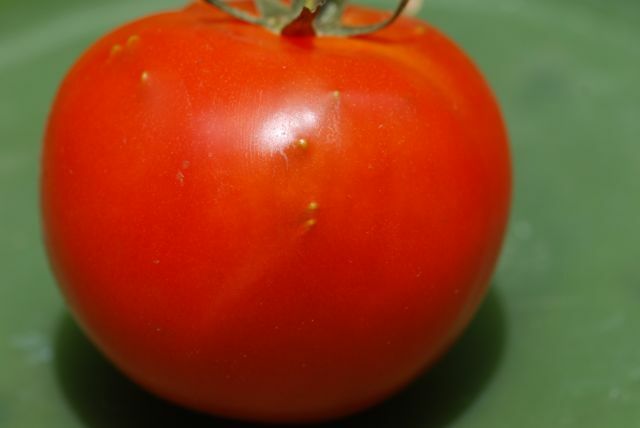 It turns out that it isn't all that uncommon for certain cultivars of tomatoes to do this, particularly the "tomatoes-on-the-vine" variety from the grocery store. The first part of this video explains it is called vivipary when the seeds sprout inside the fruit, usually when still attached to the mother plant. 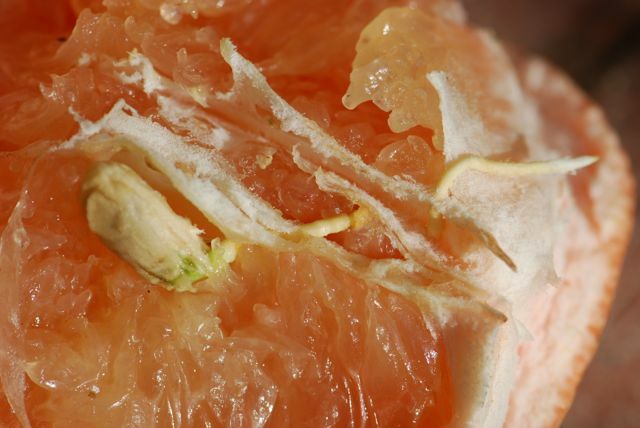 We also regularly see seeds sprouting inside our pink grapefruit towards the end of the season. These are from fruit still hanging on the tree. Can you see the long root? 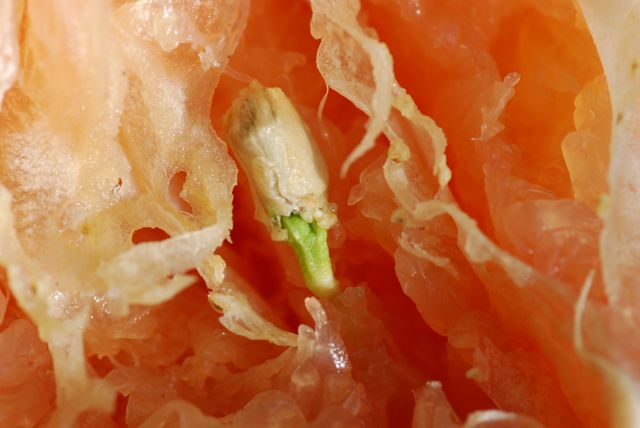 Have you ever opened a fruit and found a seed sprouting? Very cool. Thanks for letting us know. 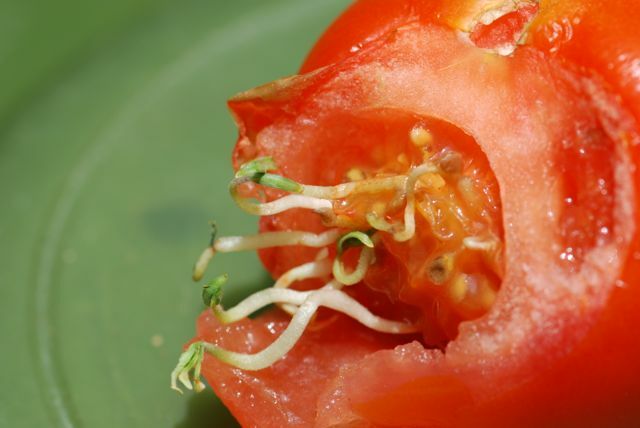 Are you going to hold onto one of the tomatoes to see if the seed will sprout in it? After a year, might just eat them! I'll see what I get. But, I also broke off a 5" suckered and stuck the stem into the same pot. It is showing signs of survival also. I didn't do anything but make a hole and stick it in the dirt. Maybe it's a new immortal?! ?